Recently, after a long absence, I was invited to return to spiritual life by His Holiness Bhakti Charu Swami, with whom I had developed a firm relationship. 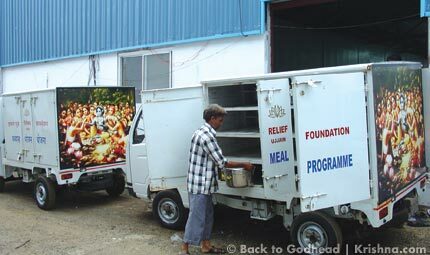 He helped my family move from South Africa to ISKCON’s one-year-old Radha-Madana-Mohana Temple in Ujjain, Madhya Pradesh. Having given up my hedonistic artistic life, I was filled with trepidation, uncertainty, and fear. It had been twenty-two years since I became an initiated disciple. 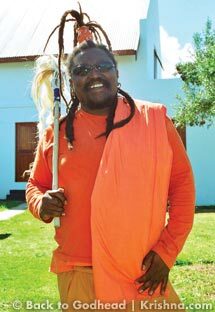 In the early eighties I was the first black South African to step back from the apartheid struggle and cross the divide to Krishna consciousness, away from the violent maelstrom of political upheaval endemic to my life. Filled with violent hatred of the apartheid regime, I was fortunate to cross paths with the Hare Krishnas through the gift of a Bhagavad-gita. Mesmerized by the lyrical and spiritual quality of its revelations, I became disgusted with the continual ritual of violence—domestic, social, political, and even academic—that accompanied my existence. I decided to jump ship from my Rastafarian, ganja-smoking lifestyle and join the search for true meaning. The adventure took me to ISKCON UK’s new-devotee program in the English Midlands, followed by initiation at Bhaktivedanta Manor and devotional service at the Soho Street temple in London. I left the Society in the mid-eighties and again took up arts activism in South Africa. During this ambit I got married and became the infamous iconoclastic cultural terrorist Zebulon Dread, renowned for fearless satirizing and vilification of society. I published six books and ten wickedly puerile, profane, and publicly denounced fanzine magazines, and I performed onstage in self-penned one-man shows with the distinct aim of vomiting caustic humor upon society. After two decades of being “the great upsetter,” I had enough and jumped ship again. This time, by Krishna’s plan, I brought an entire family along. Mumbai was hot, sticky, noisy, and alive at 2:00 A.M. when we got off the plane. Our first time in India, we were to take a train to Ujjain, with no idea of what to expect. The person delegated to assist us forgot to hand over the train tickets in Mumbai. Amazingly none of the train officials threw any tantrums. Everyone was helpful, and before long a telephone call arrived confirming our ticket reservation numbers, and the situation was amicably resolved. The helpful conductor was most pleased to receive some prasadam from Radha-Rasavihari, the presiding deities of ISKCON Mumbai. I was impressed by the placid, cool, and mature handling of the whole matter. In the morning, after a journey that gave us only small glimpses of Indian life through the darkness, the train stopped at the umpteenth station and, looking outside to what seemed a rural backwater, we leaned back thinking that this could not possibly be it. But then a helpful and intrepid fellow traveler made it known, in a frantic pitch, that this was indeed Ujjain—and we’d better move quickly. Many hands joined in the frenetic race to help the family quickly disembark. The ride through the streets of Ujjain was an eye-opener. Cows stood chewing the cud in the middle of the road. Traffic crisscrossed like Japanese kamikaze pilots. A camel, an elephant, a bullock cart, and numerous handcarts vied for space on the road. My daughters screamed with surprised delight, absorbed in the maddening chaos. Upon asking our guide, Lakshminatha, if this was normal, he simply laughed. There were people everywhere! Eventually a huge billboard announced ISKCON Ujjain. I had earlier asked Lakshminatha about the many temples dotting the landscape outside town. He said Ujjain has many temples of Lord Shiva, but it is where Krishna and Balarama studied sixty-four subjects in as many days under the tutelage of Sandipani Muni, whose ashram is still a much-visited holy place. 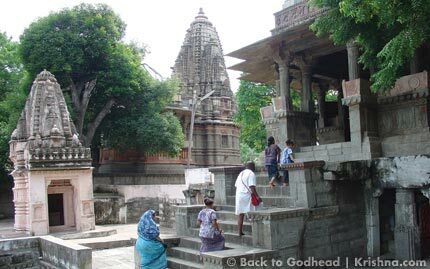 Ujjain is home to the Mahakaleshwar Temple complex, where a beautiful Shiva-linga is worshiped. Ujjain is revered as one of the seven places where Shiva eternally resides as the protector of the holy site. Ujjain is traditionally considered one of India’s seven holy cities and one of the four places where the eternal nectar of the demigods fell upon the earth after a major struggle with the demons. This ancient occurrence has given Ujjain the spiritual gravitas that marks the Kumbha Mela, a festival that takes places every twelve years. During that time the city is packed to the rafters with a few million pilgrims from all over India. Also in Ujjain, on the bank of the holy Shipra River, is Rama Ghat, revered and worshiped as the site where Lord Ramacandra bathed eons ago. Amid this ancient environment that resounds with loud bells is the new kid on the block: the contemporary temple complex of Sri Sri Radha-Madana-Mohana, a marble masterpiece. Bedecked in the white marble of Makrana, Rajasthan, which also decorates the Taj Mahal, it stands proudly as a testament to the resolve of the ISKCON devotees to continually expand the mission of Sri Chaitanya Mahaprabhu. Impressed by the temple’s pedigree, we eagerly take darshana of Their Lordships Radha-Madana-Mohana, Krishna-Balarama, and Gaura-Nitai (Chaitanya Mahaprabhu and Nityananda Prabhu), who adorn intricately carved gold-leafed wooden thrones that shine forth like shafts of molten gold under the delicately balanced light. An effulgence emanates from the altar that gives us a soothing feeling and a welcome that defies poetic description. The gold leafing, we are informed, is a meticulous procedure that requires oodles of patience, dedication, and devotion. For the first time in my life I see the Supreme Lord in His blue-black rain-cloud color and immediately desire to one day take Him home to South Africa. 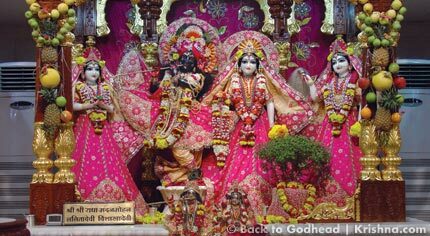 Everyone should perceive His well-dressed three-bending form prancing about for the delight of His eternal consort, Srimati Radharani. I quietly make a vow that, if He allows me to stay and reform my incorrigible character, I will one day build Him a gorgeous temple and worship Him as Sri Sri Radha-Syamasundara Africa-Ishvara. Srimati Radharani emits a radiantly coy smile and alluring, loving looks. The gopis Lalita and Vishakha accompany Radha-Madana-Mohana. Seeing them blush in delight, my overly dramatic daughters gasp with joy. The altar is a bustling spiritual universe of dramatic color, and the air is redolent with that fragrance known only to devotees who have lived in a temple. It stays with you for a lifetime. Getting my first whiff, I breathe deeply and quietly weep for having been away so very, very long. Looking up, we are all astonished at the fresco adorning the ceiling—a splendid depiction of the Lord in His rasa-lila. Superlative skill has brought to life this innocent dance that melts the hearts of the staunchest transcendentalists. The temple is still a work in progress but stands as a testimony to the resolve of the devotees, inspired by their leader, to finish the main construction within one year. 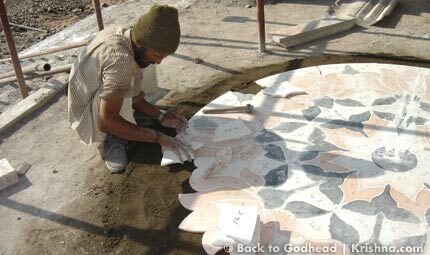 With only a host of young devotees with very little or no building experience, Bhakti Charu Swami cajoled, chided, energized, and inspired his team to pull out all the stops to make this amazing vision a reality. A short while after our arrival, a group of devotees arrived from Taiwan. They charmed Ujjain with their tinkling Mandarin and infectious enthusiasm underscored by Chinese humility. On seeing the deities, they gasped and gorged their eyes on the feast of resplendent outfits that shimmered on the effulgent Lords. Seeing these devotees was a stark reminder that Srila Prabhupada created a home for the whole world to live in. The members of the Taiwan group were some of the first visitors to enjoy the fully functional twenty-eight-room guesthouse. Govinda’s Restaurant, on the ground floor, is slowly cutting its niche with gourmet vegetarian fare in a sanctified environment free from the ubiquitous Bollywood music that pollutes the atmosphere wherever you go. On the top floor an auditorium awaits fresh ideas for Krishna conscious theater, as well as classical music, traditional dance, and devotional conferences. 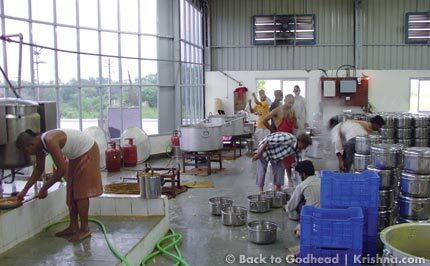 In an adjoining building resides the brahmachari ashram, with its ground-floor prasadam hall and central office complex. Like the guesthouse, it is covered in white marble. In Ujjain, generous appreciation for this magnificent achievement abounds. The temple has become a new Ujjain holy site, visited by thousands who have turned this once dusty plain into a festive arena. They marvel at the well-tended gardens and the lively kirtanas and avail themselves of the bookstand and prasadam kiosk. I was pleased to watch passing motorists and cyclists stop, disembark, and offer obeisance from the road on the way to their daily activities. It is a heart-melting miracle for Ujjain to have Krishna and Balarama back after fifty centuries. This city renowned for its educational institutions and its culture has proudly welcomed this new entrant to its stellar spiritual history. People who have never before seen such lavish worship stand in awe. I sometimes wish I could understand what the garrulous and always animated villagers are saying. 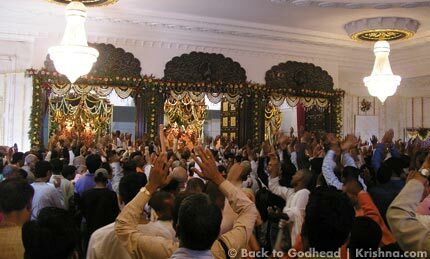 The temple is a moving mass of humans at every evening arati as Sri Krishna, by slow devotional degrees, turns them toward the Supreme Truth that is Himself. I muse that Lord Shiva, the greatest devotee, must be very happy. 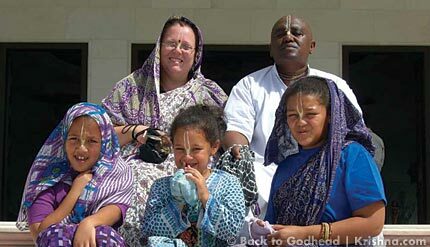 As our spiritual life takes shape, my family and I absorb many special elements of the Vaishnava culture. In a corner, tucked away on the northwest side of the temple, a Tulasi garden sprouts beautiful bushes used in the everyday devotional rituals. It is a nook for meditation on Vrindavana. Alongside, a small cow-pen hints at what will become a thriving cow-protection program. My daughters screech with delight upon witnessing the birth of two calves. Enchanted by this mystical life, they constantly sing the many new songs pouring into their hearts. I have never allowed them to enter the public schooling system. They are untouched by modern popular culture. 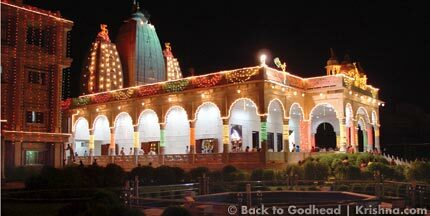 Many majestic plans pepper the ISKCON Ujjain future, some already taking shape. A midday-meal project is kicking into action with the goal of feeding 21,000 school children one nutritious meal per day. 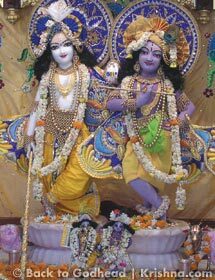 A murti-making project supplies Prabhupada deities all over the world. An IT center and a film studio are in the pipeline, and land is being acquired for a primary school. Family residences will augment the guesthouse.